Or, "Don't Be Fat: a Manifesto." Pulled this off the shelf at Grandma’s. I have read a lot of Hardy Boys books this way. It’s a fine plot involving taxidermy and short-wave radios, whatever. What stands out in this particular book (perhaps all Hardy Boys books?) is how often they call Chet, the boys’ best chum, “fat.” Or “stout.” As in, “By the time the two brothers had reached their fat friend’s side…” or “The fat boy sat on the sidelines…” or “we’ve certainly left our fat friend in the lurch for a long time…” (all actual quotes). 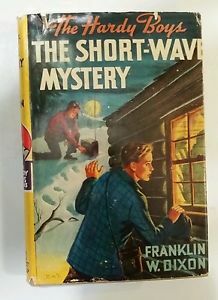 The Short-Wave Mystery, by Franklin W. Dixon. Chet brightened up and hastened back inside the shop. There he purchased, progressively, a handful of chocolate bars, a bottle of lemon soda, half a pound of fig crackers, three oranges, two ice cream cones and a small bottle of pickles. He ate all of these in the course of an hour. I can only assume that Franklin W. Dixon, circa 1945, wanted young boys to find fat Chet repulsive and to want to be good, in-shape American citizens like Frank & Joe. Because Chet is never going to get a dame at this rate.